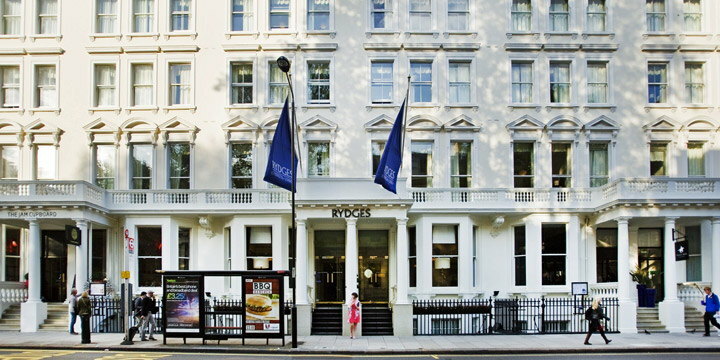 From December the Rydges Kensington London will be operated as the 'London Kensington Hotel managed by MeliÃ¡ Hotels International', and in the first quarter of 2019 will be renovated and adapted to the MeliÃ¡ Hotels & Resorts brand standards before being renamed the MeliÃ¡ London Kensington Hotel. From December the Rydges Kensington London will be operated as the 'London Kensington Hotel managed by Meliá Hotels International', and in the first quarter of 2019 will be renovated and adapted to the Meliá Hotels & Resorts brand standards before being renamed the Meliá London Kensington Hotel. The new hotel strengthens the brand's international portfolio and adds to its presence in major European cities such as Paris, Berlin, Madrid, Luxembourg and Vienna, reinforcing its positioning in the bleisure segment which responds to the trend among business travellers to enjoy leisure experiences and discover the local environment during their business trips. At the World Travel Market, the Executive Vice President and CEO of Meliá Hotels International, Gabriel Escarrer, expressed his satisfaction with the new hotel and added that "we are the only one of the top 20 international hotel companies that has focused its entire portfolio of brands on the leisure and bleisure segments, with all of our brands conceptually positioned to operate as resorts in urban destinations with a high leisure component. London is the perfect example". The city is also booming in terms of visitor arrivals, with the number of international arrivals growing for the eighth consecutive year in 2017 by 4% to 19.8 million visitors, making it the second most visited city in the world.. Together with the ME London and Meliá White House, two hotels with an excellent performance history, the new hotel will add 81 rooms to the company's portfolio in the city, located in the prosperous district of Kensington in west London - only two minutes away from Gloucester Road underground station - with numerous shopping, leisure and cultural facilities. The main attractions in the area include Kensington Palace, Holland Park, the Albert Memorial, the Royal Albert Hall and Imperial College. The southern part of the district is also home to important museums such as the Natural History Museum, the Science Museum and the Victoria & Albert Museum. Very near Cromwell Road, the hotel provides a restaurant, bar, meeting rooms and wellness area. The renovation will focus on the transformation of the lobby to create dining space inspired by Spanish cuisine and make the dining experience the social heart of the hotel. It also plans to improve the spaces for meetings and events while adding all the Meliá Hotels & Resorts brand attributes to meet the needs of modern travellers with a focus on their well-being.